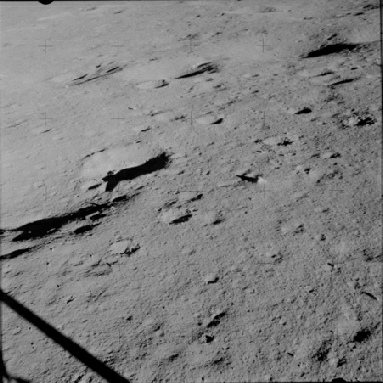 Apollo 14’s return to the moon does not have much in the way of shadows to help us in this particular exercise in that there are few repeat shots of the the same features with known height that allow comparisons. The area itself is also relatively featureless, so it I difficult to pick objects that are visible in satellite imagery that allow us to determine shadow extent. We do however have repeat views of the same features that show definite movement of shadows over time, and we can have a look at those. 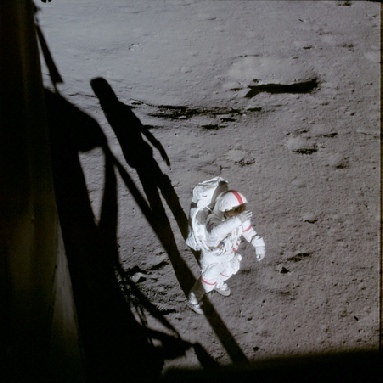 So, Apollo 14 landed at 09:18 on February 5th 1971, and the first EVA started almost 5.5 hours later at 14:42. The sun angle at the start of the first EVA is recorded as 13 degrees, moving to 15.5 degrees by the EVA end 5 hours later. The sun angle by the end of EVA 2 was 24.3 degrees. One of the first examples of shadow change comes in comparing the view from the LM shortly after landing compared with the start of EVA-1. 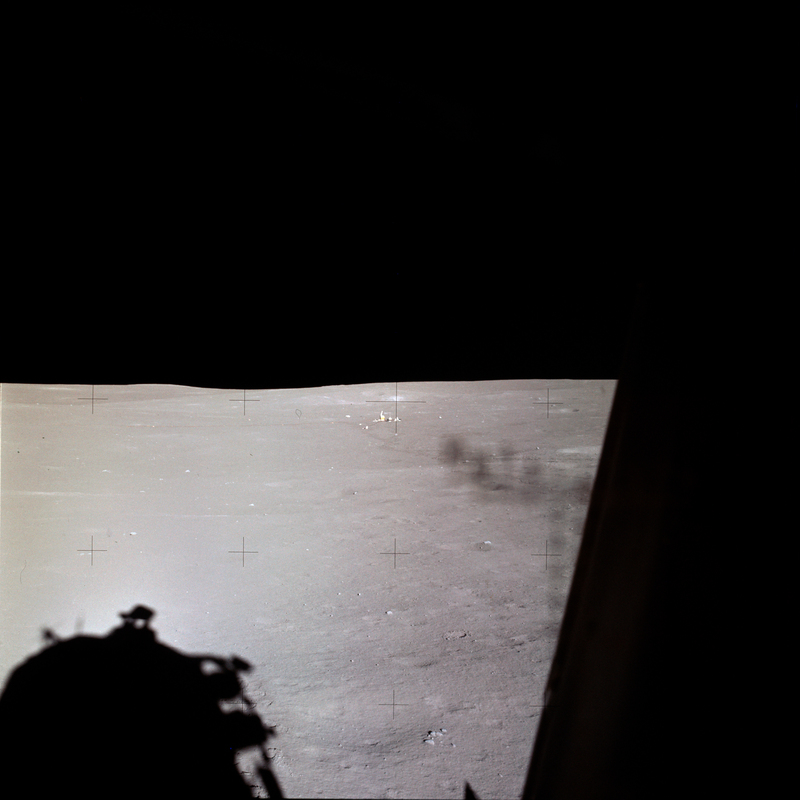 At 109:46, 91 minutes after landing, Ed Mitchell took a panorama of the view, then a photograph looking down from his window. 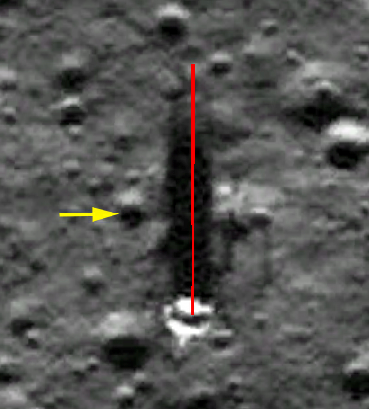 At 113:51, Alan Shepard was on the surface and Mitchell took a very similar shot. The two images (AS14-65-9206 and AS14-66-9229) are shown below. The area of interest here is the distinctive crater with two ‘rabbit ears’ extending from it. I’ve zoomed in on it below. I have rotated and stretched the one on the right so that the orientation matches the one on the left. Just off the centre of the crater there is a small partially buried rock, and it is hopefully obvious that in the short time between the two images the lunar shadow has moved as the sun has risen higher. We can also compare this view with the same crater shown immediately after the dust had settled post-landing, as taken by the 16mm camera (right), where the shadow extend across that small rock. We also have a small amount of overlap in the form of the LM shadow. 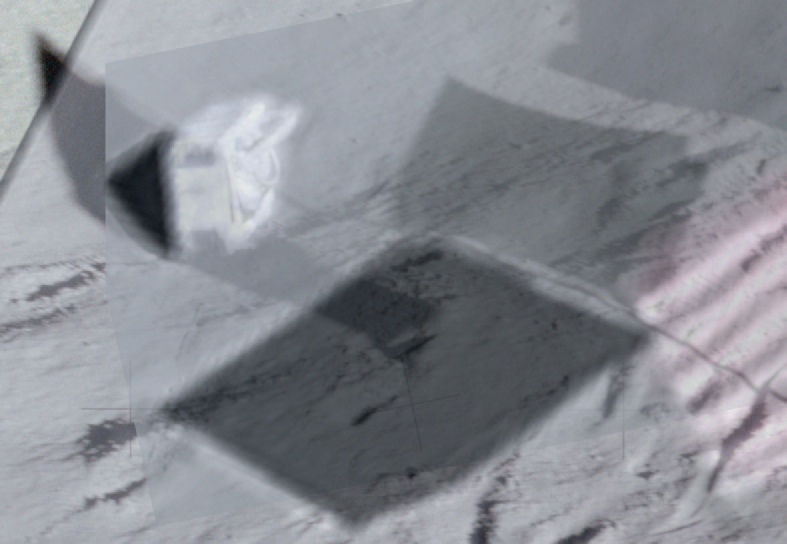 Below is a crop of part of that shadow from the two photographs, with the one on the right the later image and the red lines showing the position of the shadow edges in the earlier image. There has been very obvious movement across the photograph of the shadow from right to left. Despite the lower resolution of the 16mm still, there is still identifiable movement of the shadow, and this movement is both consistent across the other pictures and proportional to the amount of time elapsed. Speaking of the LM, we should perhaps have a look at the panorama taken immediately after landing to see if the shadow length is consistent with what should be on show. The LRO view is also an early morning view and the shadow cast by the remaining descent stage is a good match for what we can see in the Apollo photograph, although arguably not as long.. 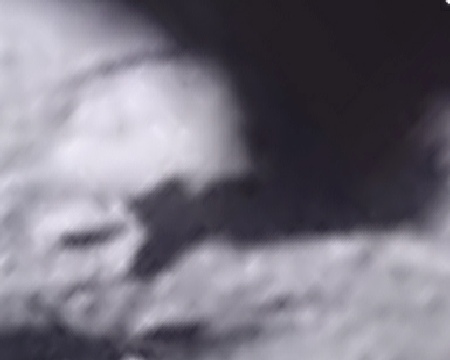 The position of the top of the LM leg shadow (level with the top of the yellow arrow crater in Apollo but well below it in the LRO shot) suggests that this photo was taken earlier in the lunar morning than the LRO view, and thus is casting a longer shadow. Sadly, the lack of other landmarks makes it impossible to be definite about the exact shadow length, but we can say that it is very consistent with the mission time. We can also look at how the shadow length changes over time by comparing it with a photograph taken after EVA-1, AS14-66-9318. In the photomontage below, 9318 is superimposed on to AS14-65-9213, images picked to allow adequate overlap of surface features. 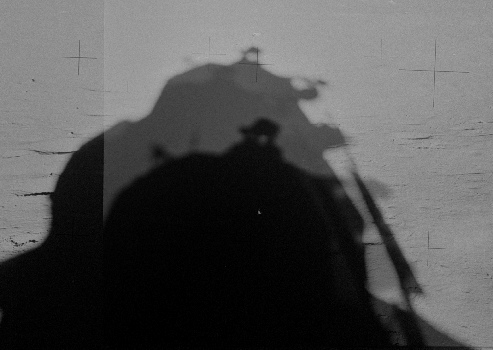 The shadow has become considerably shorter in the hours since landing, and is now consistent with the LRO view shown above. We can find one more view of the LM shadow that falls between these two times in the form of a panorama taken at the start of EVA-1. The panorama’s angle makes it difficult for us, but it is possible to pick out subtle differences between it and the pre- and post-EVA views using small rocks. On the side nearest to us, there is a small rock that sits just next to the shadow of one of the legs. This same rock can be seen partially lit in the pre-EVA shot (below left). On the other side of the shadow there is a cluster of small rocks, and while the viewing angle makes it difficult to say with certainty what the nearest point of the LM shadow to this cluster is, it is evidently not the same part visible in the pre- and post-EVA views (below right). 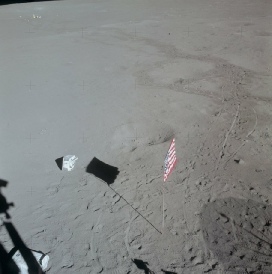 The other useful indicator of shadow movement in Apollo 14’s images is the flag, for which we have a few images right up to the launch of the ascent module back into lunar orbit. I’ve picked three images here, shown below, AS14-66-9324 (below left), taken between the two EVAs, AS14-66-9338 (below centre), taken after the PLSS units were jetissoned, and a still from the 16mm footage immediately before lift off from the surface (below right). 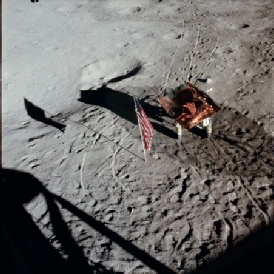 All three were taken from slightly different angles, and in order to compare them I have used the earliest image as a reference, then aligned the flagpole shadow as it undulates on the ground before then matching up the various small rocks and footprints. The result is below. As I’m sure someone with sharp eyes will notice, the flags are all at different orientations, despite two of the images being taken after the EVAs. The reason for this is that the LM was depressurised after EVA-1 to start EVA-2, and again after EVA-2 to allow for the jettison of material. The resultant gushes of air moved the flag. It’s also worth pointing out the shadow size and change in size over time in the ‘rabbit ear’ crater visible n a three images and comparing them with the analysis carried out at the top of this page. 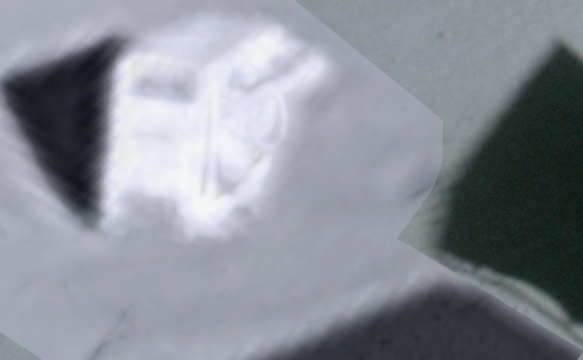 Speaking of which, we can also look at a detail in the panorama that also features that crater. Over on the left hand side of this detail is the cluster of rocks referred to before, and the crater in question is on the right. 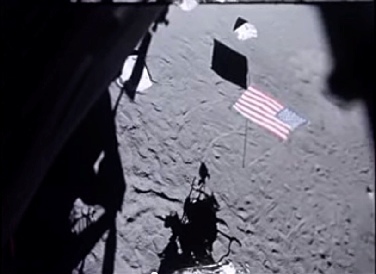 The pointed shadow just short of the rock cluster is the tip of the flag shadow, very obviously way beyond the position it can be seen in in the other images. So there we have it. 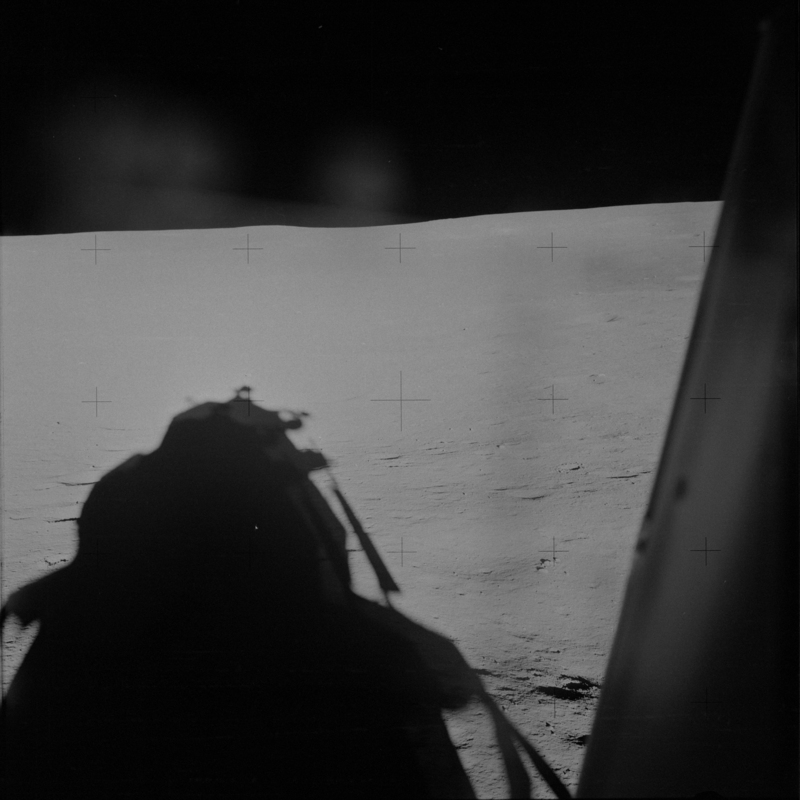 A lunar module shadow that has a length consistent with what we would expect for its time of landing, and that moves in a manner entirely consistent with the document mission timeline. This movement is matched by other surface features and equipment.